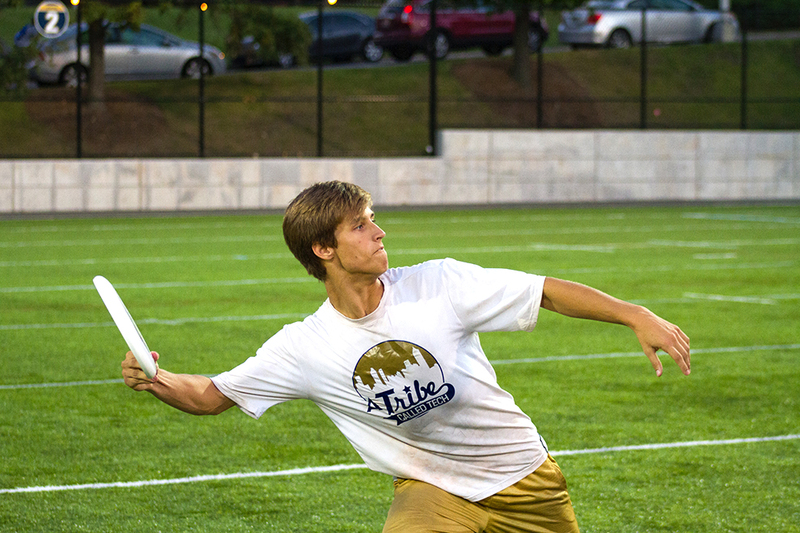 This past weekend, Tribe, Tech’s men’s ultimate team, competed in Classic City Classic (CCC) in Athens, Georgia. The tournament was hosted by UGA’s ultimate team and is one of the premier tournaments in the country, featuring seven teams that went to college nationals this past season. Tribe was seeded 13th for the tournament and was placed in a pool with Dartmouth and Central Florida who both participated in nationals last year. Tribe’s first game was against UCF, and they won 8-7 on universe point, upsetting the number five seed at the tournament. Tribe’s first three games were won on universe point including a 10-9 victory over the fourth seed, Dartmouth. At 3-0, it put Tribe into the driver’s seat going into the pool, which they ultimately won. They finished 4-1 on the day, beating Auburn 11-8 to clinch pool D.
“One of our biggest goals was to break seed. [We] came in ranked 13th and wanted to prove ourselves against some of the biggest teams and play them at their level, and we accomplished that,” said grad student captain John Dugan. The following day, Tribe moved onto the winner’s bracket where they lost a 15-14 game against Michigan who finished fifth last year at Nationals and lost the following game to UNC 15-11, who were national runner ups. Tribe won the 7th place game against Auburn 9-6. CCC, being one of the top tournaments in the fall, gave Tribe a great chance to test themselves against some of the best competition in the country. It presented more of a challenge than Tribe’s first tournament of the year, Itchfest, which they won without losing a game. College ultimate allows five years of eligibility, which means that graduate students are very common in college ultimate. Tribe has always had several key graduate students, and this year, Nathan White and Andreas Gabrielsen have joined the program. White is from UC Davis, and Gabrielsen was a captain at Rowan University. White, who led the team with 25 assists and scored 11 times, has had a major role on this year’s team, and his versatility allows him to play every position. Dugan praised the two new players saying that their experience will help the team succeed next spring. Tribe also returned many key players from last year’s team including fourth year captains Devon Rogers and Stephen Burkot as well as fourth years David Egbert and Patrick Panuski. Rogers and Panuski tied for the lead in scoring at CCC with 13 scores each. The team is hoping their experiences at CCC will help them this spring. “I do feel like our performance at CCC will be positive momentum going into next spring because we performed much better than most other teams were expecting, and we proved that there weren’t any teams there that were significantly better than us,” said second year EE Michael Tillitson. Tillitson, who was a former high school basketball star, is 6-foot-7. His height and athletic ability make him a very tough matchup for opposing teams, and being only a second year, he has great potential at Tech. “I feel I played well but still need to further improve my throws and defensive footwork,” Tillitson said. Dugan believes that the identity of the team has changed since he’s been at Tech. In previous years with former stars Nick Lance and Jay Clark, the team was very reliant on them and their ability to out-athlete their opponents. Dugan thinks that the team is more well-rounded than in the past and isn’t reliant on one player to have a part in every play. Like Dugan, Tillitson is excited for the spring season as both are confident that Tribe will have a great shot to make Nationals next May. Tribe is currently ranked #21 in the country by USA Ultimate.